Community Blog - Could a Burp-less Cow Help Reduce Global Warming? Could a Burp-less Cow Help Reduce Global Warming? According to Environment Canada, cows produce about three-quarters of total methane emissions with most of their gas coming from their burps. Burps are a powerful thing it seems; twenty times more potent than CO2 as a greenhouse gas in fact. With this fact as the eco focus Canadian scientists set out to help the humble cow reduce its footprint. Scientists first examined the genes in all four of a cow's stomachs (no wonder they produce so much gas) responsible for methane production in the hope they may be able to breed more efficient, eco friendly cows. 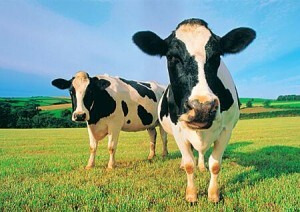 It seems by using advanced genetic technologies it's possible to breed animals that produce 25% less methane. Other ways we can reduce the ecological footprint of cattle is by farmers breeding cattle that grow faster. This will reduce the time the animals are left standing in a paddock and moved to market faster (which doesn't bode well to animal advocates) and reduce their gas emissions. Another method is to feed cows a diet higher in energy and rich in edible oils such as alfalfa, flax and hemp. These forms of food nutrients will ferment less than grass and lower quality feed. Burp-less beef could be the way forward for meat eaters everywhere.